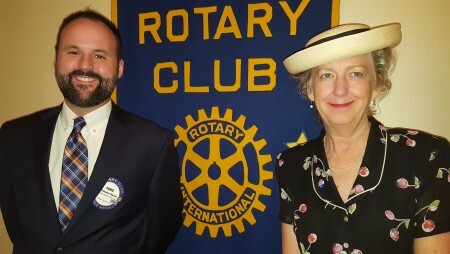 On August 9, the Rotary Club of Auburn, Alabama, hosted Kathryn Smith, who discussed her book, The Gatekeeper: Missy LeHand, FDR, and the Untold Story of the Partnership that Defined a Presidency. Part of her presentation was done in first-person narrative from the perspective of Marguerite “Missy” LeHand, widely considered the first—and only—female presidential chief of staff, and the right-hand woman to Franklin Delano Roosevelt—both personally and professionally—for more than 20 years. Pictured with Smith is Club President Chris Warren. For more information about the Auburn Rotary Club or how to become a member, visit www.auburnrotaryclub.com.